Governor, 1824-1827; Attorney General of N.C.; Congressman. His home was 400 yds. 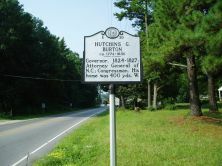 W.
Despite some uncertainty as to the exact place, Hutchins Gordon Burton appears to have been born in Mecklenburg County, Virginia in 1774, the son of John Burton and the former Mary Gordon. 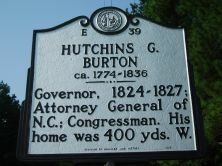 Orphaned as a small boy, Burton was reared by his uncle, Colonel Robert Burton, in what is now Vance (then Granville) County. 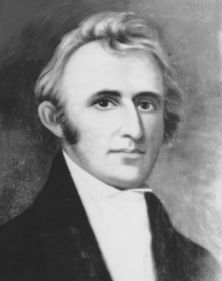 He attended the University of North Carolina from 1795 to 1798, studied law under Judge Leonard Henderson, and in 1806 began the practice of law in Charlotte. Burton married the former Sarah Wales Jones, daughter of Revolutionary patriot Willie Jones of Halifax.